Dental care is an important component of your overall health, and a beautiful smile can make you feel confident in everyday life. Serving the communities of Brooklyn, Manhattan, and Staten Island, NY, Atlantic Dental Care is your trusted family dentist. 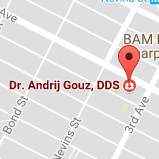 Dr. Andrij Gouz provides comprehensive dental care to ensure your ideal oral health, all in an atmosphere that will put you at ease. We understand the importance of creating a comfortable, welcoming environment, and we’re sure that your time with us will leave you smiling! Our team is friendly and ready to help make your dental experience something you’ll never forget. We’re always available to answer any questions you may have regarding your oral health or treatment plan, so don’t hesitate to ask! Please feel free to contact our office to schedule a complimentary consultation with Dr. Gouz today!